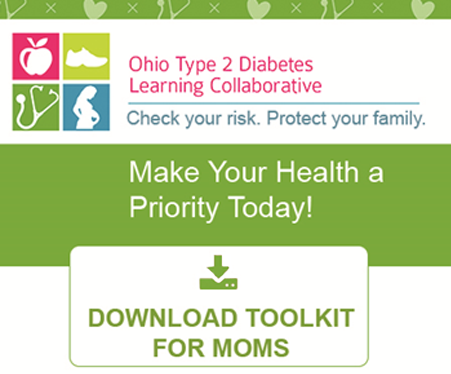 The Ohio Type 2 Diabetes Learning Collaborative developed several resources to aid providers in the treatment and care plan for women of child-bearing age at high risk for T2DM. 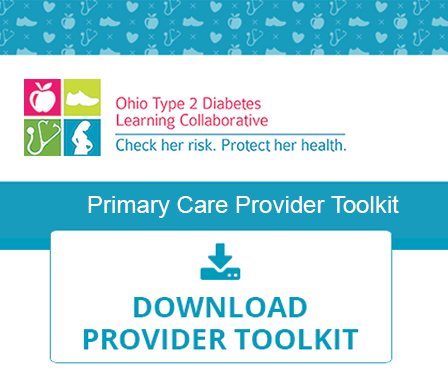 In consultation with nationally-recognized subject matter experts, along with feedback from participating providers across Ohio, a clinical toolkit and consumer resources have been adapted for providers and support staff. The lifetime prevalence of the development of type 2 diabetes for women with a history of GDM is as high as 60%, depending on cofactors. In response to this growing problem, clinical experts have developed key information for both providers and consumers on T2DM assessment and screening recommendations. Please click on the images below for more information.